Kotobukiya’s Facebook Page has revealed a new Marvel Statue. 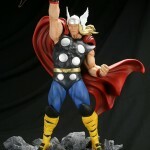 You can check out their upcoming Thor Classic Avengers Fine Art Statue. The mighty Thor is back and better than ever! In 1962 comic book mastermind Stan Lee set out to create a new superhero, one who was incredibly powerful. He found such a character in Norse mythology, the god of thunder. A true champion of good, he has fought beside many other Marvel Comics superheroes throughout the years, including several incarnations of the Avengers. 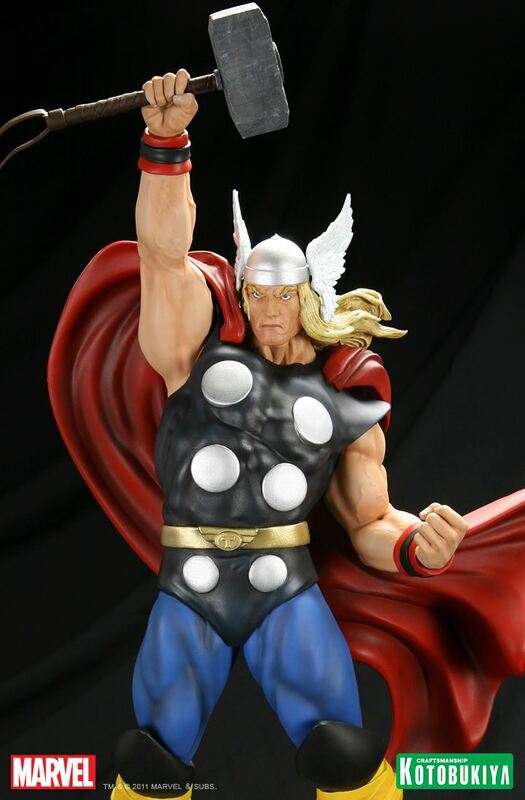 It’s in that spirit that he appears as the first in an all-new fine art statue series: Thor Classic Avengers! Coinciding with the upcoming Avengers film in 2012, this series celebrates the classic versions of some of Marvel’s greatest heroes, starting with the Asgardian warrior who just this year received his own feature film. Based on classic art by Jack Kirby, Thor stands as a literal god upon the field of battle. Huge and muscular, the god of thunder poses triumphantly with his magical hammer Mjolnir held high above his head as though daring the enemies of Asgard to challenge him. The classic look is authentic from the colorful costume (sleeveless black belted tunic with silver discs, blue pants, yellow wrapped high boots, and red cape) to his hair and accessories (red and black wristbands and silver winged helmet). 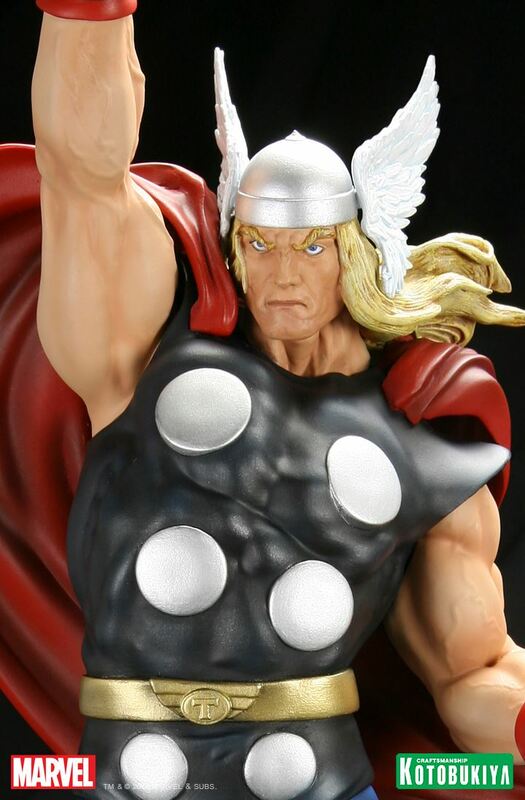 Thor has an incredibly detailed sculpt that captures every bulging muscle, crease and fold of his costume, and the flowing strength of his cape and long blonde hair. Particularly well done are the powerful but battle worn Mjolnir with its chips, cracks, and iconic inscription and the deity’s face focused fiercely on the battle at hand. 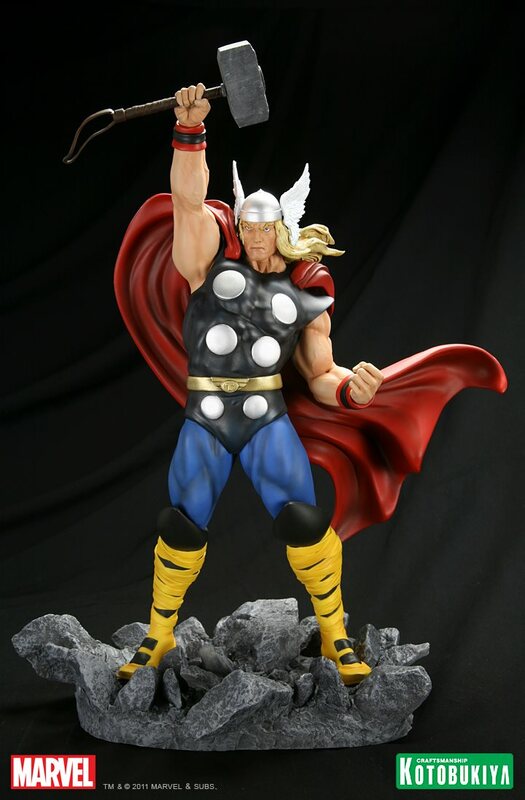 Sculpted by Erick Sosa, Thor dominates the fine art statue series at nearly 13 ½ inches tall. The blast from the past stands on a crushed rock terrain base that will match those on the other upcoming Classic Avengers: Captain America and Iron Man! Start building your classic Marvel team with Thor just in time for the film. Im actually not that impressed with this sculpt. The arm with the hammer looks off to me as if its not muscled enough and too fatty. Also his face sculpt isnt that detailed IMO.